Cultivating a relationship with your fans means getting clear about your attitude toward showing up in their Instagram feeds. I’ll confess: I’ve probably taken more than my fair share of cellphone concert photos over the years. I work hard to be discreet. Usually, Lori or I will snap a quick picture at the very start or the very end of a set. WHOA. No problem, but that confrontation made it hard for me to enjoy the show. We ended up leaving. And that interaction has been bouncing around in the back of my head for months. Two threads of culture threaten our shared live music experience. One, which I’ll write about in depth over the coming weeks, pulls the focus of a live event away from the stage and into the crowd. (You might call this a form of stereotypical Millennial narcissism, but I think it’s more nuanced than that.) The second poses operational problems with the process of actually putting on a show. We’ve allowed ourselves to build a world in which nothing happens without photographic proof. Did I really go to that concert if I didn’t take a picture, tweet it out, and add it to my Instagram photo map? A few weeks back, Lori and I saw Steve Martin and Edie Brickell with the Steep Canyon Rangers on their bluegrass tour. Performing in a very quiet, dark concert hall, LED screens, flashes, and clicking-camera sound effects became very distracting. 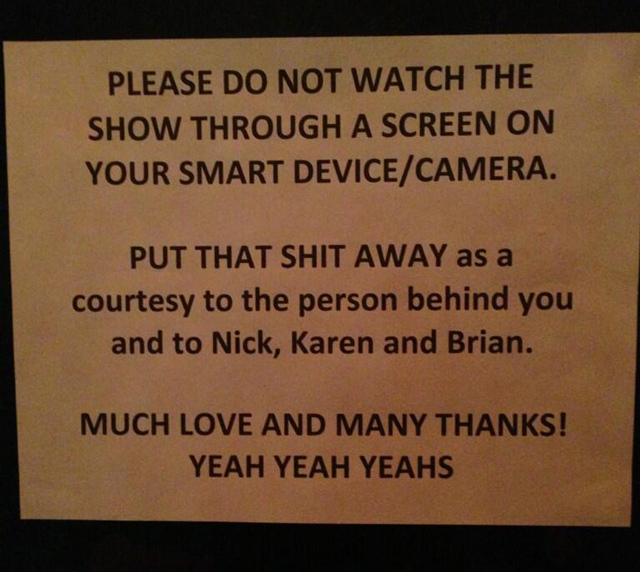 Please, if you’re in a darkened theatre watching a live show, don’t check your phone. Your face lights up like the moon. If you’re performing in an intimate venue, the bright light from a mobile device can be even more disconcerting than the flash from a point-and-shoot camera. Some performers also get very nervous that lots of lit-up faces mean that the audience’s attention has drifted away from what’s happening on stage. That disconcerting feeling can cause you to defocus, and deliver a less than stellar performance. For some performers, a photo ban (or even a full-on mobile device ban) is the only way to ensure that audiences remain focused and engaged in the moment. It’s an epidemic of discourtesy. RT @JohnnyOPSU:I really enjoyed seeing your show through the iPhone screen of the guy in front of me. To my eye, the She & Him sign is a playful callout to a similar posting that the Yeah Yeah Yeahs hung at concerts earlier in the spring. By on If you’ve been to a rock concert recently you may have been distracted by the swarm of glowing screens held aloft by audience members. While the Yeah Yeah Yeahs sign got lots of positive reactions in the press, there’s a bigger backlash against Zooey online. And that’s where our disconnect kicks in. People assume that Zooey Deschanel, who makes much of her living from acting and modeling, would feel completely comfortable having her photo taken in concert. They’re surprised to learn that she shares the opinion of Steve Martin, Karen O, and a growing number of working musicians. 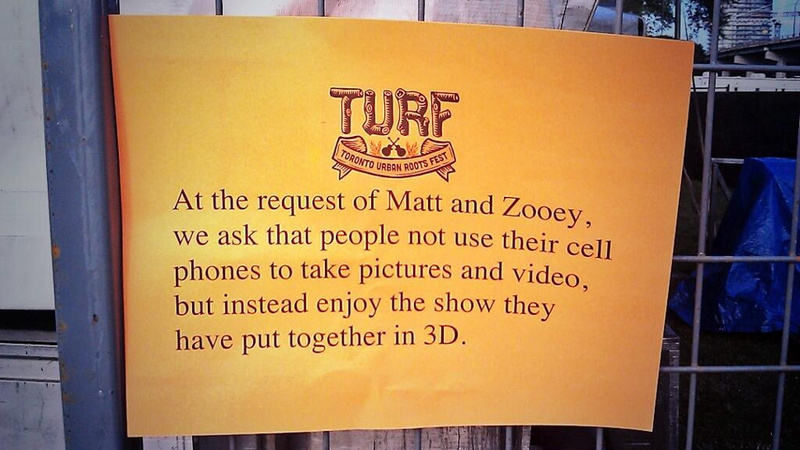 @steve_mcgill @scroll @SewellToronto ‘Zooey doesn’t want to see phones!’ Manager, verbatim. @Gawker I agree with Zooey. I’m tired of idiots blocking my view while videotaping the concert. Put down the camera and enjoy the show! The biggest problem, as I learned firsthand, involves the methods venue security will use to handle your fans if they’re caught breaking a policy. I’ve known and worked with security guards at all kinds of venues, and they’re generally concerned about one thing: following the venue’s written rules and the artist’s rider to the letter. They’re following direction from their manager, local law enforcement, and an artist’s management. Fans are not part of that equation, and will be treated as such. This is how it’s been for at least the last 60 years, and it’s always surprising to encounter someone who thinks those rules won’t apply to them, especially when enforced by a gentleman seven or eight times their size. If a venue or an artist has specifically banned cameraphones, don’t be surprised to hear stories about security personnel smacking devices out of concertgoers hands, confiscating phones, or ejecting fans from venues altogether. Contrary to online chatter, there’s no First Amendment right to free speech on private property, during a performance covered by ticketholder terms and conditions. At your shows, your fans are entirely at the mercy of your venue’s house rules, and any amendments you agree upon with venue management. However, the venue won’t end up getting the blame for an overzealous bouncer’s behavior—the artist will. A misunderstanding that escalates to physical action can wreck your relationship with a fan, ruin the experience for their neighbors, and grow into a sour social media situation. As an artist, it’s more important than ever to communicate your stance on phone use in clear, specific ways. No matter how cute you make a sign, assume nobody will read it. Post a note to your blog that states your position, and why. If you want people to spread as many photos of your gig as possible online, offer up a hashtag and a space on your official web presence where you’ll aggregate photos. If you find phones a distraction, say so. Your perfect audience should know, going into the venue, exactly what behavior you expect from them. Casual fans, dates, and other folks that happen to come out to a gig should find out the same information, before you take the stage. Most regular readers of this blog and my books probably can’t wait to have this kind of problem to deal with. If that describes you right now, you’ve got two courses of action. Either get comfortable now performing with camera phones, or become strong at enforcing boundaries that just might earn you more long term respect from live audiences.